Photo: Harrison DeLong House, ca. 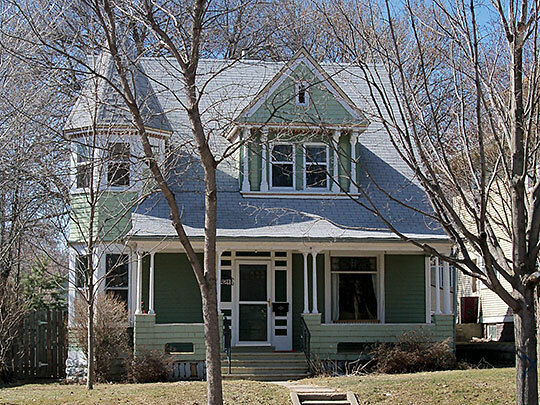 1889, 621 South Main Street, Sioux Falls, SD. Listed on the National Register of Historic Places in 2000. Photographed by User:AlexiusHoratius (own work), 2010, [cc-by-3.0 (creativecommons.org/licenses/by/3.0)], via Wikimedia Commons, accessed July, 2013. The Minnehaha County Court Clerk's offices are located at 425 North Dakota Avenue, Sioux Falls, SD 57104; phone: 605-367-5900. † Gregory Mathias, Preservation Consultant and Lynda Schwan, South Dakota State Historic Preservation Office, Dell Rapids Residential Historic District, Minnehaha County, SD, nomination document, 2000, National Park Service, National Register of Historic Places, Washington, D.C.